Ceramic Heat sinks can eliminate additional layers, thermal barriers and the number of components in Heat sink assemblies. Our patented Cam-clip has a positive impact on the assembly process and cost. They are also suitable for high-power LED or resistor Housings, insulator pads and heat spreaders. We also offer customizing ceramic heat sinks, parts and analysis to meet customers special needs in the new products developing. 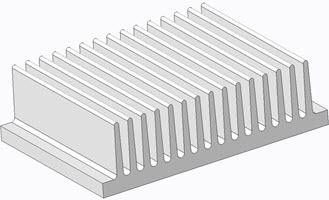 WC-CTO-38E-PC Ceramic, 38.4mm Height 2.89 Order Now..
CM102-30-50E-C Ceramic, 41.8mm Height 3.89 Order Now..
SHS-CH-100 Ceramic Heat Sink, Straight Fins 2.67 Order Now..
SHS-PAD100 Insulator Pad for TO-218, TO-247 and TO-3P 0.39 Order Now..